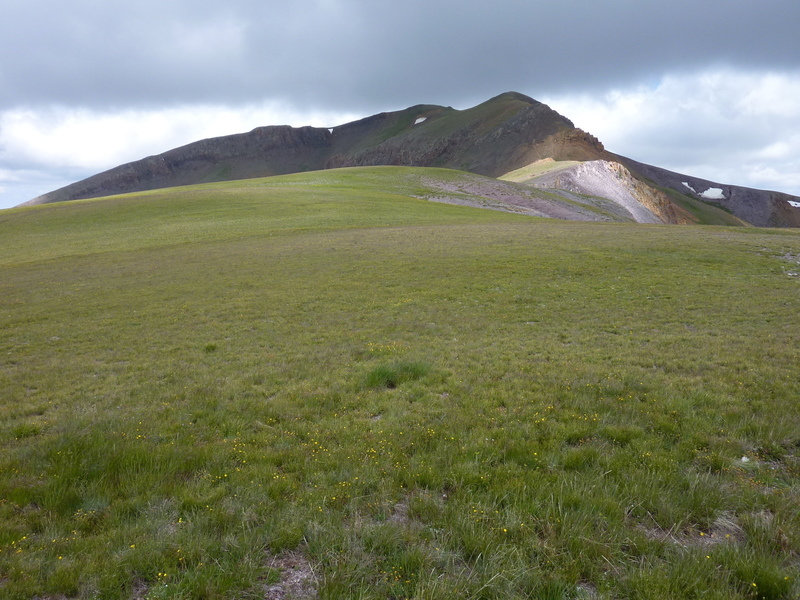 Delano Peak is the highpoint of the Tushar Mtns, the third highest range in Utah. It has well over 4,000ft of prominence, is the highpoint of two counties, lands on the LVMC list and best of all, isn't that hard to get to. It also happened to be on my way across the western US to Telluride, CO where I was to meet up with friends for a week. Leaving I-15 at Beaver, UT, I drove paved SR153 east for a number of miles to the signed turnoff for Big John Flat. This good dirt road can be driven by any vehicle for the first four miles to Big John Flat with high clearance vehicles able to drive many miles beyond that. Big John Flat seems to be quite popular with RV and ATV enthusiasts as well as a sizeable herd of cattle found grazing in the lush meadows. In contrast to the surrounding deserts of the Great Basin, the range appears to attract local weather systems and stays green all summer after the snows melt. Having rained the day prior, I drove in on damp or wet roads during the night, parking to the side shortly after reaching Big John Flat. I tried to reach the TH for the Skyline National Recreation Trail a mile further, but the road had begun to get a little rocky and it didn't seem worth taking extra chances. In the morning I repositioned the van to be better off the road and struck off on my intended hike, a loop taking in three peaks of the Tushar Range. I followed the road northward to the intended trailhead and then a little further before leaving the road to gain Delano's West Ridge on a cross-country route. The trees give way from the start to open alpine terrain, climbing some 1,700ft in a mile and a half. I'd seen photos of folks struggling up steep talus but they must not have gone this way - the entire route is rounded, green slopes, portions of which have a decent use trail (perhaps cow trails?). Clouds hung around all day, reducing some views, but it never rained and kept temps on the cool side. I reached the summit of Delano in an hour and a half. Someone has erected a good-sized sign with the peak name and elevation, as well as a mailbox register. It seemed grossly out of place and I was beginning to understand why some folks see summit registers as trash, rather than treasure. Along with the assorted random scrap papers that such registers attract was a 2013 notepad left by Sue and Vic Henney - Californians doing their thing across the nation. Despite the low-hanging clouds, most of the high peaks of the Tushar Range were visible. Baldy and Belknap lay to the northwest, Shelly Baldy to the west, Brigham and Edna to the northeast, and Holly to the southeast. I dropped down a somewhat steep slope in this latter direction heading to Holly, finding that those photos I had seen must have been staged somewhere in this vicinity. Once down this section it becomes a very easy hike over to Holly, taking about 45min. Lower by a few hundred feet than Delano, Mt. Holly comes in at just under 12,000ft. A pile of rocks had been left to mark the highpoint, but thankfully no signage. Continuing southeast, I soon came upon a herd of about two dozen goats grazing the slopes. They spotted me soon afterwards, deciding I was one too many and sauntered off over the north side of the ridgeline and out of view. The last peak I visited was Lake Peak, another 600ft lower than Holly which sits askew off the main ridge. After intersecting the Skyline Trail I continued cross-country to Lake Peak, climbing the east side whose last hundred feet or so comprised a jumble of rock with little vegetation. I descended back down the same side, finding the Skyline Trail which I used for most of the return. About half a mile from the TH I had passed by earlier in the day, I left the trail to shortcut the return with a more direct descent down to the main road. It looked good on the GPS I consulted and worked out well in practice, with no bushwhacking required as I descended the slopes towards Big John Flat. Back on the road for only a short distance, I was surprised by the number of ATVs I crossed paths with - the place seems exceedingly popular with this crowd though they have no trails leading to the higher summit reaches - those places are left to the foot travelers and the goats.